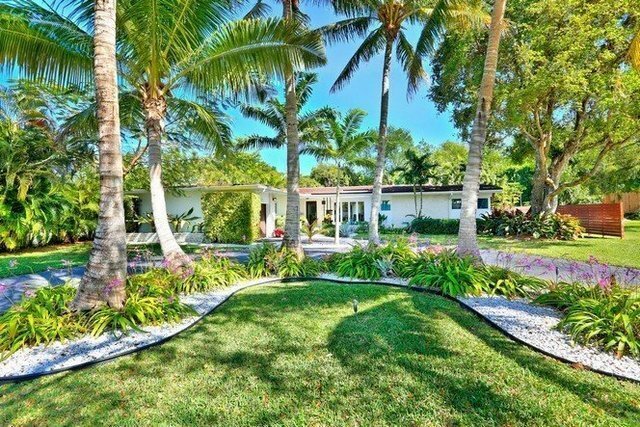 Stunning home, surrounded by close to a half-acre of lush tropical gardens in prestigious Bay Heights. Light-filled formal living, dining and family rooms with walls of glass overlooking the ultra-private, resort-style pool and terrace.Major renovation in 2015, including porcelain tile and wood flooring, custom built-ins and impact glass throughout. A spectacular open kitchen features sleek euro-style wood cabinetry, stone countertops, gas range, high-end stainless appliances, island with seating and breakfast area.Four bedrooms, four baths, plus housekeeper's room. Expansive master suite includes his/hers custom walk-in closets and spa-like bath with soaking tub and frameless glass shower.24/7 community security patrol. Close to the Grove village center s bayfront parks and marinas and minutes to downtown, MIA and the Beaches.